“The body keeps the score” by Dr Bessel Van Der Kolk is a New York Times best seller. This powerful book is the result of a lifetime of curious, passionate and empathetic research and clinical practice in the field of trauma, by one of the foremost world experts on traumatic stress. Dr Van Der Kolk details the effects of trauma and neglect, not only on our ex-service men and women, but on our society as a whole. It is essential reading not only for those who have experienced trauma, or those who treat it, but for every member of society, so that we can begin to change the way we treat signs of distress arising from trauma. Dr Van Der Kolk describes the trauma experienced by our soldiers in war and the resulting isolation, self medication and anger they experience as a result. This is how we as a society typically see trauma. Yet, he also describes the hidden epidemic of “developmental trauma” of children brought up in a family of abuse, neglect or violence. Of which there are billions, walking amongst us, trying to deal with unimaginable hardships. Van Der Kolk uses exhaustive and irrefutable logic, science and research to argue that understanding and treating trauma, in a compassionate and intelligent way, would have immense benefits to our individual well-being, and the well-being of society as a whole. He shows clearly that recognizing and treating those who have been traumatized in war situations, or traumatized through abuse or neglect within the home or elsewhere, would lessen the load on our hospitals, police services, courts and prisons. Trauma and neglect, and an inability to voice one’s despair, to a largely deaf society, leads to isolation, rage, depression, relationship breakdown, alcoholism, drug abuse, imprisonment or hospitalization. Van Der Kolk’s research and arguments are strong. He tells us that half a million children in the U.S. are taking anti-psychotic drugs, with children from poor families four times as likely as those with private health insurance to be taking them. 12.4% of children in foster care take anti- psychotics compared with 1.4% of medical eligible children in general. This, sadly, indicates links to poverty, and the routine drugging of children who have experienced familial breakdown and loss and whose reactions to this are, understandably, violent. These drugs make the children more manageable, but they remove their motivation, curiosity and playfulness and put them at risk of becoming morbidly obese and developing diabetes. In his case studies, Van Der Kolk gently and meticulously unlocks the often horrific abuse, traumas and neglect that his patients have experienced and hidden or locked away from their conscious memory. Van Der Kolk looks at how trauma affects memory, shutting out extreme trauma that a person has no ability or tools to deal with, no words to use to express the horror. He shows that the symptoms of this abuse, the alcoholism, rage, anorexia, obesity, excessive exercising, perfectionism and other self-destructive behaviours are usually a way of coping with intense emotions that the patient is unable to deal with. He also looks at the well-reported link between auto-immune diseases and trauma. 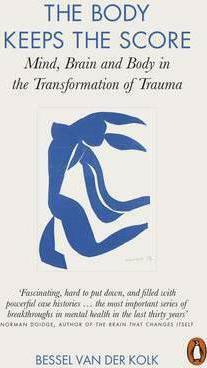 The book explores a number of ways to alleviate the effects of trauma. Many of the therapies the author describes involve the patient looking at the trauma more objectively than they originally experienced it. Removing the shame, guilt and self disgust that they feel in relation to it. Van Der Kolk does this with intelligence, empathy and curiosity, and without judgement or criticism. Giving the event a narrative that refutes the patient’s feelings of guilt, shame and self- hatred. He allows the patient to acknowledge the trauma as objectively as possible and enable them to look at themselves in a kind and protective way, as they should have been treated at the outset. Van Der Kolk responds with kindness to his patient’s obvious distress once he has helped them face the horror of their experiences he teaches them how to connect with and understand their emotions, and teaches them techniques to calm themselves and to communicate. This is something missing throughout our society. A person exhibiting extreme distress is shamed, criminalized or ignored. One example of our failure to listen to extreme distress, and to blame the traumatized victims, can be seen in the Rotherham scandal. The vulnerable and damaged victims tried many times to report their horrific abuse but, due to them exhibiting signs of trauma and abuse, they were dismissed as trouble makers. As a young woman I worked in the Police Force. During my time in the police I saw regular over-zealous use of section 5 of the Public Order Act 1986 to arrest those whose behavior was not “orderly” or who were showing signs of distress. No-one waited to talk to the arrestee or to ask why they were agitated. This power of arrest allows police to arrest anyone whose unusual behavior may “alarm” another person. Trauma, by its very nature isn’t orderly and traumatized behavior will cause alarm and distress. By arresting a person who has been traumatized we are not only not listening to them, but we are further robbing them of their liberty and criminalizing them. Silencing and stigmatizing them further. Police training might enable an officer to spot traumatized behavior and react in less confrontational, more empathetic way. This would have the added advantage of easing the burden on the courts system, police time and legal aid, meaning a saving for the tax payer. Proper training and an understanding of trauma would enable police, doctors, teachers, judges, nurses, social workers and the general public to react appropriately rather than to stigmatize, shame, criminalize, ignore or ridicule. In this way we may attempt to lift the stigma and remove what Van Der Holk describes as the “godforsaken isolation of trauma”. Although, not everyone who experiences trauma comes to the attention of the police. Often they are successful in their careers, utilizing their isolation to focus on a PHD, or their perfectionism to work as a leading oncologist, as Van Der Kolk exhibits in his case studies. Van Der Kolk ends his incredible book by giving us a glimpse of how we should proceed. He and his colleagues established a National Child Traumatic Stress Network with more than 150 centers throughout the United States. He focuses where trauma has the greatest impact, on children and adolescents. He explains that teachers often find it difficult to teach children who are too spaced out, angry or having tantrums. Yet, a good education is the best hope for traumatised, abused and neglected children. He advocates a different culture in schools, whereby a child who exhibits anger is not removed from the classroom or penalized, but is encouraged into a “safe space” where there is a sensory distraction, such as listening to calming music, and wrapped in a warm, heavy blanket. Once calm, the teacher can encourage the child to speak about, and connect, with their emotions. This is favoured over contacting the child’s parents and reporting the behavior, risking the child being further shamed and at risk of further physical violence at home as a result. I can only imagine that this attitude and shift in culture will bring much greater benefits than a culture of drugging, ostracizing and penalising. Dr Van Der Kolk calls trauma an “urgent public health issue”. Our hospitals, prisons, courts, police and social services are at breaking point yet we, as a society, maintain our stiff upper lip and look the other way when it comes to listening to and aiding the traumatised.